Injuries to the meniscus are one of the most common problems that occur in patients with knee pain. 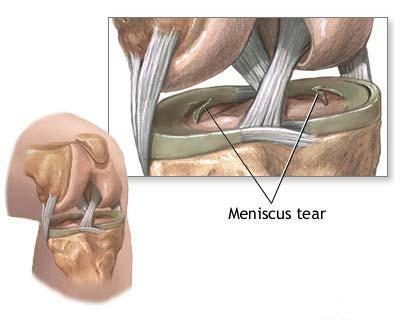 The meniscus is a cushion or shock absorber separating the two bones that bear the weight in the knee. The meniscus has several functions including acting as a stabilizer to help balance the weight, as well as provide a cushioning effect. The meniscus is actually two components of a disc shape, one on the inside and the outside of the knee referred to as a medial and a lateral meniscus. The meniscus can be damaged with twisting or cutting maneuvers placing undue force on the knee especially when the knee is bent and planted. It may also occur with heavy lifting or torquing across the knee and as the aging process ensues, the meniscus can become worn, degenerated, and tears more easily. According to Dr. Lox, most patients are interested in what can be done to help heal the meniscus once it has been damaged either from an acute sporting event or trauma or as a result of old trauma in which the knee is now worn down and patients wish to avoid surgery. If the joint has been completely eroded as a result of an old meniscal injury, often patients are told they may need a joint replacement and in facing a total knee replacement, patients often are looking to alternatives to having a total knee replacement. Dr. Lox states that frequently he will see patients that are wishing to avoid this. They are interested in regenerative medicine techniques, platelet-rich plasma or stem cell therapy to avoid knee replacement. In the acute setting, whether it is sports or acute trauma, the future is looking towards repairing knee meniscal tears rather than surgically correcting them. In the 70’s, the entire meniscus was removed. This resulted in accelerated arthritis of the joint and this technique was mostly abandoned. Arthroscopic incisions to repair the meniscus often are nearly a means of cutting around the meniscal injury which may create a larger defect and over time allows more bony surface to become eroded and accelerate the degenerative process. The use of regenerative medicine stem cell technology is an attempt to halt this process to prevent the ravaging effect of progressive arthritis through regenerative means. Dr. Lox notes there is a lot of interest, not only in research along the lines of halting degenerative arthritis but also in repairing acute injuries before they become much more significant and degenerative in the future. This only makes sense in trying to address the problem early and not waiting for it to become a bigger problem in the future.